This weekend, my wife and I had the most amazing adventure. Technically, it started two weeks ago,when we made the incredibly crazy decision to buy a boat. And not just any boat. A 1959 42-foot wood trawler. For just $4,900. You know what they say about buying a boat, right? The less the purchase price, the more the overall cost of the boat. I felt like challenging the odds. 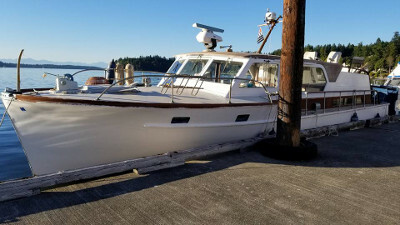 I decided to buy the boat based on the seller's word that the two diesel engines ran just fine, and that it wasn't actively leaking, and that the boat had been to Alaska and back. I bought it before even getting fresh batteries in the boat to start it... because, hey - $4,900 boat! After spending a day with my family cleaning the previous owner's decades-worth of accumulation, paying a diesel mechanic to give the engines a quick view, and spending some money to replace a raw-water pump, we were in luck: the engines were in great shape. They fired right up, and were easy to control. 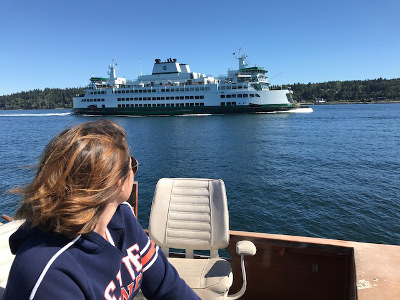 After spending some time draining the bilge (the existing bilge pumps were toast, we hooked up a household sump pump to address any water intrusion), we decided to brave the trip from Bremerton to Olympia. At an average of 6 knots, this was going to be a long trip. And... we made it! 8.5 hours this Saturday, we pulled the boat out of the previous owner's boathouse, took it to the nearby fueling station, and then ventured out into Puget Sound. 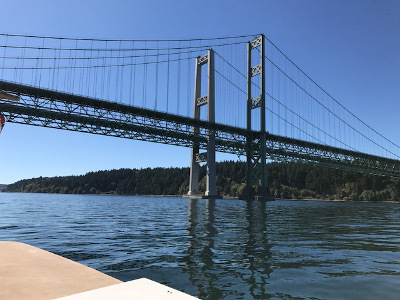 We had to learn a few things along the way - like how to make sure the engines were synced up properly (the stock tachometers weren't hooked up), how to feather the transmissions to get the boat to turn on a dime, making parking much easier, and how to fight the wind and current near the Tacoma Narrows Bridges. Along the way, we saw 14 harbor seals and a manta ray playing on the surface. 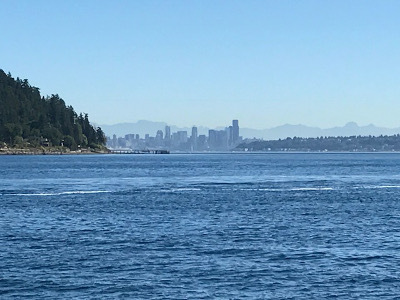 We also got to see Seattle and Mt. 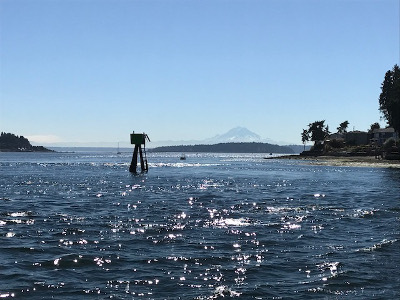 Rainier from the water in a way we'd never seen before. 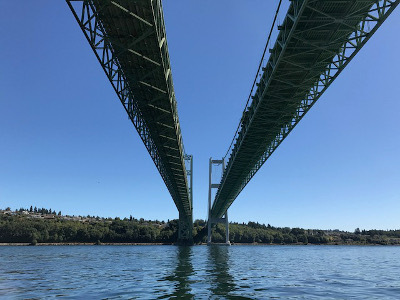 We got to go *under* the Narrows Bridges! And we took turns piloting the vessel. In all, this was one of the most romantic weekend we've ever had. And we also both decided that, after this grand adventure on this old wood boat, we are definitely boat people. Big boat people. But... not necessarily this boat. 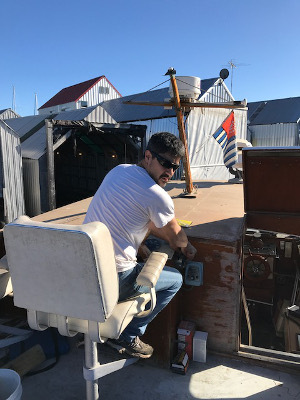 Old wood boats need a lot of maintenance, and this one is no exception. It also doesn't have the layout that's conducive to family life. We do have 3 kids, after all, and having an open "family room" style layout is important to us. 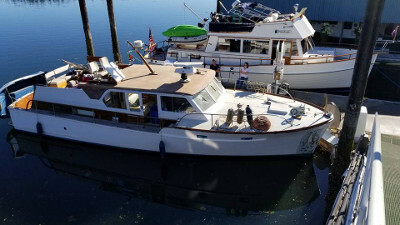 So we listed the boat for sale for about the same price I paid (plus the cost of the new batteries I put in) as soon as we landed in Olympia, and have already taken a deposit. I'm a little sad to see it go, but I'm glad we got to learn quite a bit about boating in a fun, high-stakes kind of way. This concludes the adventure on this particular boat. But it is just the beginning of the boating adventures that the Culley family will enjoy. Thanks for reading!